True confession. I love chicken. I don’t eat chicken because it’s less expensive than other meats, I eat it because I love how easy it is to prepare and even more how versatile it is. 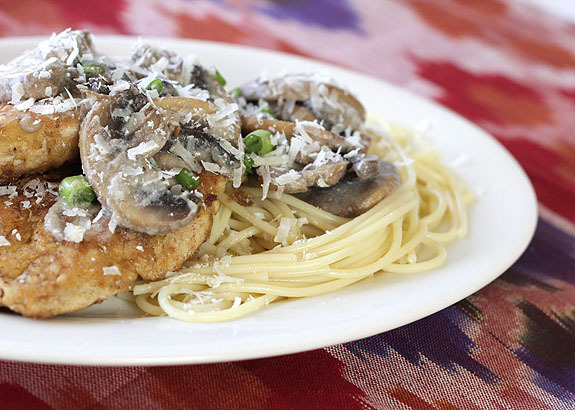 And this Chicken Scallopini with Mushrooms is one of my absolute favorite dishes. The finished result is beyond the ease of preparation. OK…so another true confession? I was creating this post and playing around with the new hrecipe requirements that Google specs now require. I got a phone call and then…yes I did…I hit publish and don’t even remember doing it! Just about died when I saw THIS post RT’d on Twitter. So, just like mistakes happen to the best of us in the kitchen, this web person made a big snafu. So…it’s out and whatever story I had to share (which really…was all about how good and how easy this dish is!) will forever be lost. Luckily I had a photo…have never quite sized and edited anything so quickly in my life! A wonderful and easy dish which combines chicken and mushrooms in a white wine sauce served over pasta. Place breast pieces between 2 sheets of waxed paper and pound with a mallet or other flat instrument to a thickness of about 1/8 inch. Heat 2 Tbsp. each of butter and oil in skillet. Add mushrooms and sauté until tender. about 5 minutes. Remove mushrooms and reserve. Heat remaining butter and oil over medium-high heat. Add breasts and sauté, turning once, until browned, 4-5 minutes total cooking time. Add shallots or green onions to pan and cook, scraping bottom until tender about 4 minutes. Add white wine and broth, boil, reduce to simmer and cook until liquids are reduced by half. Stir in cream and season to taste with salt and pepper. Add mushrooms, chicken and capers and simmer to reheat. Serve immediately over linguini or steamed rice and serve with a green vegetable. Great recipe! Made this last night and everyone loved it, but we all agreed that the next time I make it the sauce ingredients have to be doubled or tripled. That made me laugh…I might have thought the same thing but worried it was my daughter who would have put it in a cup and had it for a beverage she wanted so much of it. I’ll take another peek; it’s been awhile and maybe it is time for an update! So glad to hear you enjoyed it; thanks for taking the time to let me know! Delicious!!!! Definitely a keeper– the only change I made was to slice the chicken before plating. A rich and delicious meal– my husband loved it and can’t wait for me to make it again! Thank you! Good to hear Judi; it’s one of my favorites too! So glad you enjoyed it Stefanie; sometimes a reader comment will remind me of something I love but haven’t made in a long time. You did just that and now I know what’s for dinner! Thanks for taking a look at my blog, and thanks for the parlor game suggestion! I have watched the movie and it baffled me how many artistic liberties they took! Most of all, though, thanks for the great recipe! This might be one of my new favorite dishes! Be sure to take a peek at the chicken thighs I just posted this week Kaelyn; I do love me some scallopini but for easy and oh so good; they are now a new favorite dish here. Thanks for paying a return visit; glad I found your blog! This looked so delicious that I couldn’t wait to try it. And it was absolutely delicious! But I must have done something wrong. When I put the half and half, the sauce curdled a little bit. Everything was freshly bought for this recipe and I followed it exactly. Any ideas why or suggestions of how to prevent it next time? All I can think of is that the the sauce might have been a bit too hot and the cream reacted? I’m not averse to something like that happening here but my trusty stick blender always saves me in the end. I’d sign the WordPress petition. I’ve done it once. Afterward, I started writing the posts in another document and pasting them in. Turned out to be a great post anyway because so many can relate. Have a good week Barb. We should switch. I’ll do piccata; how’s that? your chicken scallopini does look delicious, and I think I could eat chicken just about every day too! My wife on the other hand gets tired of chicken very easily. I do know what you mean about hitting publish before you’re ready, I have done it without even knowing I get it until it was too late. Then it’s a mad scramble to delete it before any of your friends read it. So I to vote for the are you sure you want publish this button. On a more positive note, your scallopini looks great! Scrumptious picture! I love dishes like this! Nothing but good ingredients! Thank you…and it’s true. Simple ingredients and simple preparation but one of my all time favorites! Ha! I can’t tell you how many times I have hit “Publish” by mistake. Then I scramble like crazy to make the post look halfway decent. This chicken dish sounds wonderful – full of flavor and comfort. If I know it I can run over to my feed and delete it before it goes out…but my head was on the phone and then I saw it RT’d; scramble is the word! As a fellow computer/web person in real life, I had to chuckle at your hitting the publish button too quickly. I can’t tell you how many times I’ve done that same thing! All that aside, the scallopini looks simply fabulous! This has so many of my very favorite ingredients… Yum! I can relate. I love chicken too. I used to prefer red meat but as I’m growing older and wiser I’m starting to like chicken much more. Truly delicious dish. A fine everyday dinner ,whipped up in the time it takes to boil the pasta – I’m in! I better brave the storm to get ingredients! This is a dish I absolutely love! I”ve made Veal Scallopini with mushrooms based on my mom’s old recipe and love it. I’ll try yours next. It really is flavors everyone loves. Where is the picture of yours?